Great stats from Ryan Detrick(LPL Research): The S&P 500 Index has gained 2.9%, 1.9%, 2.5%, and 2.9% over the past four weeks for a total gain of 10.5%. This followed the S&P 500’s worst December in 87 years and worst fourth quarter since the 2008-09 financial crisis. What’s next? 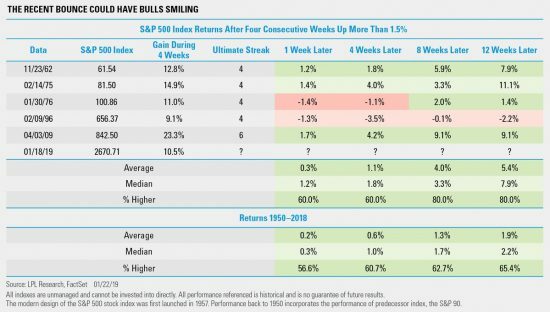 History tells us that after the S&P 500 Index is up more than 1.5% for four consecutive weeks actually tends to see continued outperformance going out the next three months.